This part is a little bit easier to write, having watched the last two World Cups myself on TV. This part is a lot shorter than it should be, and a lot shorter than many people in the early 1990s would have expected such a piece to be. For in that period, the gap between Australia and the other Rugby League playing nations was at its shortest. But for a few small incidents with major repercussions, Australia could have easily lost an international series or a World Cup, and the history of International Rugby League might be very different. But of course they didn’t lose; they bloody won, and by the end of the decade and the start of the new one the gap had opened up as widely as it had ever been, leading to a dark age in international Rugby League. The ‘World Series’ format was deemed a success after the 1988 World Cup Final, and so the four year cycle was restarted in 1989. In the next four years Australia managed to win their all their matches, (particularly galling for Great Britain as these matches doubled up as Test Series deciders) meaning that they qualified for the final a whole year before it took place. With the Lions and the Kiwis each winning their home encounter against each other, the remaining place in the Final came down to who could thrash the other two sides by the bigger margin. In the end New Zealand’s inability to completely dominate Papua New Guinea, and their inability to avoid being dominated by Australia, meant that Great Britain finished above them with a significant points difference advantage. As a result, Great Britain joined the Kangaroos in the Final. The Final took place at Wembley Stadium in front of a record crowd of 73,631, which remains a n attendance record for both the World Cup and International Rugby League. It was a tense affair, and fiercely contested. Brad Fittler will tell you that, as he received a broken nose for his efforts. Britain pulled ahead 6-4 with three Deryck Fox penalties countering two successful Mal Meninga place-kicks. However the Kangaroos had looked the more threatening side in the second half and their cutting edge proved itself when a well timed Kevin Walters pass sent Steve Renouf over the line for the only-try of the game. Watching highlights of the Final on Youtube, it becomes obvious just how important Mal Meninga’s touchline conversion was (as good a high-pressure place kick as you’ll ever see), since the Aussies clamoured all over the Lions in the play-the-ball towards the end, knowing that their opponents would have to run the penalty. In the end the Lions just couldn’t break through, and Australia jubilantly celebrated their seventh title. In 1995 the competition returned as part of the Centenary celebrations of the Northern Union’s breakaway. As part of the celebration, the Cup came back with a new format and an explosion in the number of competing teams.. Instead of the previous globe-trotting ‘World Series’ format it was entirely based in Great Britain, with a record ten teams taking part. The tournament began with several people voicing fears about the viability of such a structure, and the start of the Super League war in Australia also soured the mood by causing the ARL to declare members of Super League clubs ineligible for the Kangaroos. It all seemed up in the air when England kicked off against Australia in the opening game at Wembley. Luckily the game set a precedent for entertaining rugby and simultaneously produced a surge of hometown optimism when England beat Australia 20-16 in front of a crowd of just over 41,000. The fans also came out to see the more exotic nations taking part, with 26,263 at Central Park to see England dominate Fiji. Perhaps most impressively, crowds of ten and fifteen thousand turned up at Ninian Park, Cardiff and Vetch Field, Swansea to watch Wales’ two Group Three games against France and Western Samoa, and the Dragons responded to such support positively by winning both games. In Group Two, New Zealand were the dominant side, although they required a drop goal to beat Tonga. With the top sides from each of Groups Two and Three facing the top two from Group One, the stage was set for an all-British and an all-Oceanic Semi-Final each when Australia and England joined the Dragons and the Kiwis. Both semi-finals were close affairs. A late Phil Clarke try topped off an England victory at Old Trafford by a score of 25-10 which was tighter than the score suggests. The second Semi-Final at Huddersfield’s McAlpine Stadium was even closer. In a game for the ages, Tony Iro’s late try evened up the scores at 20-all. Matthew Ridge’s conversion missed, meaning that the match went into extra-time. In the extra period Geoff Toovey and Andrew Johns proved instrumental in leading Australia to scoring an extra ten points as they ran out the winners, the final score being 30-20. I’m really gutted, because there was a video of the extra-time period on the recently departed Stage6. It’s really noticeable how sides hadn’t mastered the art of rushing up in defence under the 10 metre rule yet and how open the game was even as the players were knackered. There was no World Cup in the years 1996-1999. There are a few reasons but by far and away the most important was the Super League war. The international calendar was one of the largest casualties of the war, with both the ARL and Super League fielding sides. With the ARL having the Kangaroos brand and Super League having opposition, there was a devaluing of the international game. It didn’t help matters that Great Britain fell off the pace significantly in this period, winning only one test against the Australia Super League side, and drawing another against the Kiwis. When they travelled Down Under for the 1999 Tri-Nations series they were humiliated, only just managing to beat semi-pro outfit Burleigh Bears before losing heavily to both Australia and New Zealand. The Kiwis on the other hand were not that far behind the Kangaroos and even managed to win the pool meeting between the two. However, in the final once again the Green and Gold Machine triumphed with a narrow 22-20 victory, showing that the ‘roos and the Kiwis were miles above competition. This leads into the events of 2000 when we got the largest Rugby League World Cup ever, and yet it is considered one of the greatest sporting debacles of all time. Australia turned up as a side so far ahead of the opposition they were talking of not conceding a try in the whole tournament. The Home Nations were either weakened or bulked up with people with celtic grandparents. The Pacific Island nations were clearly made up of Australia and New Zealand’s cast-offs. The New Zealand Maori weren’t even a nation. These factors, tied into naïve and moronic organisation (like spreading too many games around and outside the heartlands in seemingly random venues without a proper media push or a decent marketing strategy) led to the competition being derided from all quarters. Once the tournament actually started, things didn’t get much better. It kicked off in Windsor Park, Belfast, as Ireland beat Samoa in a game that was played in a deluge of rain. This marked a pattern that would keep occurring as the competition took place during one of the wettest autumns on record, which resolved to keep away many spectators. On top of that Australia beat England 22-2 at Twickenham (the first League game at RFU HQ) which served to undermine much of the expectation for the home team and reinforced the Kangaroos’ superiority. New Zealand also crushed Wales in a quarter-full Millenium Stadium, establishing the distinct hierarchy of ability that had been prevalent in international competition for the last five years. England, under the supervision of John Kear, proved to be a disappointment for the home fans, coming second in their group behind the Kangaroos and beating Ireland at Headingley in the Quarter Finals only to be absolutely demolished by New Zealand in a sparsely attended Reebok Stadium in a match which seemed to sum up rather succinctly many of the problems with the occasion. Yet there are also many positives that came out of the tournament that are often overlooked in favour of the negatives. Russia fielded a side that although was boosted with few Aussies, was predominantly made up of Russian natives (and even though they lost 110-4, they still got a try against the Kangaroos, one more than England scored in the opener). The Lebanon side, derided for abusing the parental qualification rules, became the impetus for a development movement in the country which has seen the game take root there. Amongst all the talk of mismatches, it’s easy to overlook that there were some tough, closely-fought games. Indeed, the last two matches of the tournament were worthy of any tournament. In the second semi-final, the day after England’s capitulation to New Zealand, Wales showed the importance of fighting spirit when they raced into a 20-8 lead against the all-conquering Kangaroos after 20 minutes, only to be pegged back and run out of puff towards the end in losing 46-22. The Final, for which a crowd of 40,000 turned up to Old Trafford, was also a gripping affair. Australia scored first and every time Australia would pull ahead, New Zealand would pull themselves back. Just like in the Semi-Final, Australia’s imposition of their will eventually broke down the Kiwis, who conceded a deluge of tries in the final quarter to give the Aussies a 40-12 victory that was a lot closer than the lop-sided scoreline suggests. 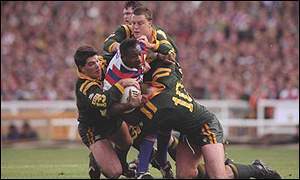 The 2000 World Cup also holds a soft spot in my heart because it was the event that got me watching Rugby League again. I had started watching the game in the early-mid 90s, and have recollections of both the 1994 Ashes series and the 1995 World Cup. Then Sky and Super League entered the fray and the only Rugby League left for terrestrial television was the Challenge Cup, with minimal international coverage. It was only when the 2000 World Cup came around that I was reminded that Rugby League existed, and that actually it’s a pretty damn amazing sport. A World Cup is supposed to be a showcase event for a sport, giving the best players in the world a platform to present the case for their sport’s greatness. Because of the perceived disaster of the 2000 World Cup (and it did send the RFL into heavy debt) the Rugby League authorities were scared off putting on another tournament until now, and Rugby League hasn’t had a medium in which to put its best foot forward. Sure, the revamped Tri-Nations has been for the most part a success (basically signalling a return to the format of the early World Cups) but it doesn’t have the romance, the history, the chance for smaller nations to compete with the big boys. This entry was posted on October 19, 2008 at 11:48 am and is filed under International, World Cup. You can follow any responses to this entry through the RSS 2.0 feed. You can leave a response, or trackback from your own site.